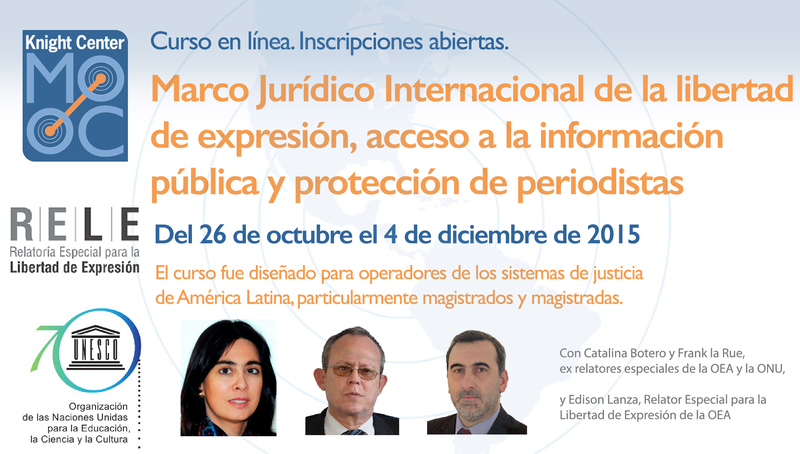 The course that starts on October 26 is offered by UNESCO and the Office of the Special Rapporteur for Freedom of Expression of the Inter-American Commission on Human Rights (IACHR) in partnership with the Knight Center for Journalism in the Americas at the University of Texas at Austin. Judges and jurists from the region can apply now for this free program; the deadline is Oct. 20. To apply, create an account at JournalismCourses.org, the platform where the course is taught. You will then receive an email confirmation with instructions for verifying the account. One your account is confirmed, complete the online application form available here. All applications are being reviewed and participants will be notified within 72 hours. The Ibero-American Judicial Summit, the Latin American Network for Schools of Judges, the Foundation for Press Freedom, the Swedish Government and various regional judicial schools and institutions support the initiative. "This initiative goes beyond the idea of ​solely ​training judicial operators, together we are strengthening the regions judicial systems. We want to encourage a broad regional debate on the protection and promotion of freedom of expression in the context of the judicial branch,” said Lidia Brito, Director of the Regional Bureau for Sciences in Latin America and the Caribbean of UNESCO. "We are very grateful for the invaluable support this program is receiving from Supreme Courts and Judicial Schools from all over Latin America," said professor Rosental Alves, founder and director of the Knight Center at the University of Texas at Austin. The course will be offered in six weekly modules from Oct. 26 to Dec. 4. There are video lectures, reading materials, quizzes, discussions and assigned activities. The course is asynchronous so there are no live activities scheduled. Lessons can be completed at the student’s pace, in the most convenient times and days for the students within each week. Students who successfully complete the course and quizzes will be able to download a certificate of completion, which does not have any kind of university credit but documents successful participation in this online program. Instructors are Catalina Botero, former Special Rapporteur for Freedom of Expression at the IACHR, and Frank la Rue, former UN Special Rapporteur on the Promotion and Protection of the Right to Freedom of Opinion and Expression. The current Special Rapporteur for Freedom of Expression at the IACHR, Edison Lanza, and UNESCO's representative in South America Guilherme Canela, also participate. The course focus on topics such as, the international legal framework on freedom of expression, the role of judicial operators in the investigating and prosecuting of crimes committed against journalists and human rights defenders, the challenges to using criminal law for ensuring the right to exercise freedom of expression and opinion, new challenges to freedom of expression such as freedom of expression and the internet, the right to public information and diversity and pluralism in the media. "We underline the particular importance of judicial officers in the protection and promotion of freedom of expression. In this sense, we consider all judges, prosecutors, lawyers, as central allies in defending this right which is of the highest importance for the consolidation of our democracies," said Edison Lanza, Special Rapporteur for Freedom of Expression of the IACHR. UNESCO and the Special Rapporteurship offered a pilot version of this course in November 2014 specifically for judicial operators in Mexico. A second course tailored specifically for the state of Coahuila in México was offered this September.